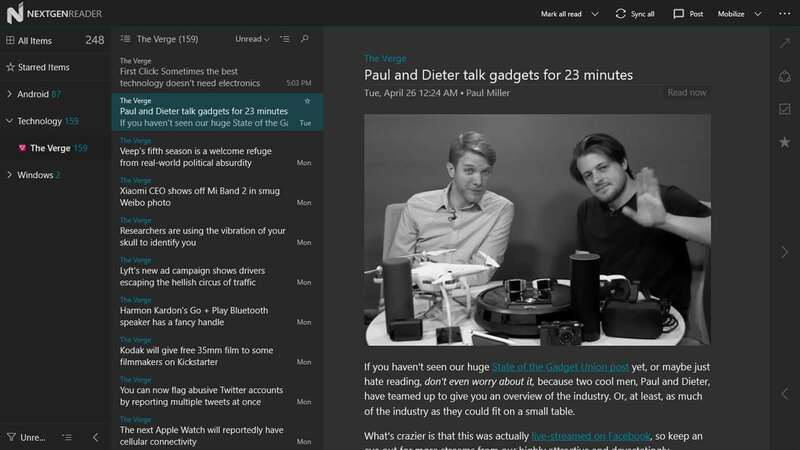 Nextgen Reader is a powerful RSS news reader tool for Windows devices. The developers have updated their Nextgen Reader app to new version 7.0.20.0. The app has now been updated as a Universal Windows app for users of Windows 10 on Desktop and Mobile. With the latest update the app has been made available on the UWP for the PC and Mobile versions of Windows 10. The developers have improved the scaling and text rendering on similar lines to the Windows 10 design along with improving the Grid View User Interface. Users will now be able to add, edit, move or delete feeds and also search for new feeds by title, URL or topics options. By pressing the F11 key or touching the logo of the app users will be able to turn on the full screen mode. The live tile counts now from 0 to 9999 and users can now have an updated context menus with new icons. With the new and updated features the team has also provided an ability to move the reading pane with a swipe and the option to select multiple feed at same time along with the usual bug fixes and performance improvements. The latest update to the app is currently live and users can download the same by clicking the below Windows Store link.